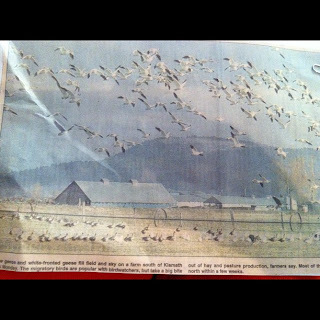 Hurricane Sandy came and went last night. The winds were strong and knocked a few trees down in the road, and we lost power about 7pm and it remains out. This morning was quiet and cold and I enjoyed the warmth of the bed as long as possible. We then drove to some friends from Beth's church, Bob and Robin's house, where we enjoyed showers and a big lunch of roasted veggies and sausage. Now three little boys play on the floor and I blog peacefully. Everyone has commented on how unfazed I am by the chaos and noise, and I remind them of my house. I miss the madness actually, and find comfort in it. Mickey called today and Oliver has a fever and therefore has to be out of school for 24 hours, which meant he had to leave work. Fortunately, he was giving a test. He has done a great job at manning things in my absence, and if the mess he describes is all that got out of hand, I can't help but admire him. Its a tough job trying to keep up with the schedules and demands of 3 children, especially by yourself. -on that note, lets give a shout to all the single parents out there!!!! Good news is that Mickey got me on a flight for tomorrow afternoon and I may very well be home by 6pm tomorrow night provided I have no more delays. What a blessing that would be. My mom and step-dad are going to be there tomorrow and will be able to help with kids. I asked my mom to make sure she put a big pot of chili on and of course, some cider, to enjoy after trick-or-treating. I LOVE chili and hope I am there to enjoy it with them. I have to say how impressed I was last night to see diligent policeman out in the strong winds and rain, hacking up a fallen tree and removing it from the road and securing some lines that were down. We were fortunate to fare well last night, and I have deep concerns for the people in other areas such as NY and NJ. It may not seem like a big deal to people down south as they know losing power is a big inconvenience, but one must remember how very cold it is here. It could certainly be colder, but I encourage you to pray for people, especially children, who are cold and scared and wet due to this storm. People have lost their homes and businesses and livelihood. I am proud of our President and other political figures (have grown fond of Gov. Chris Christie while watching the news the past few days), who are putting aside political differences and focusing on the needs of the people here. I also want to thank our first responders for being so diligent and working hard to service their neighbors. We have good news today. Today we reached a major milestone of 24 WEEKS!!!! 24 weeks is a viability week for fetus. This is huge as just a few weeks ago, we never knew if we would make it this far. This morning Auguste was active and I felt calm and hopeful that the weeks will keep coming. It is hard to believe that it has been 5 weeks since we first learned about this terrible hydrops. The weeks have gone slowly but we have learned a lot and so much has occurred since that dreadful day. We truly grieved and were never sure we would get to this day. I know that we still have a very long way to go, because we certainly want to avoid delivery in the next 8 weeks, if that is at all possible, and hope to even get further than that. However, we need 8 more weeks of improvement to feel that the hydrops will not worsen. Tomorrow morning we will be seen at CHOP, and hopefully this will clear me to get on the flight home. I have an appointment with neonatology in Greenville on Thursday, to let them meet us, know what is going on have them prepared for whatever may come with Auguste. I then need to go see my OB/GYN by Monday and will see Dr. Stephensen will maternal fetal group in Charlotte next Wednesday. Hopefully things will continue to improve and we will develop consistent and systematic followup. While I have been in Pennsylvania, I have managed to knit a few hats and will hopefully finish a blanket. I am very proud of them as most of you know I have never completed a knit project before. I made two hats for Auguste and I think I am finally moving beyond my fear of planning for his arrival. I feel more and more confident with each kick. Not too long ago I felt that I had to embrace each one as it may be my last, but they continue to come steadily and I continue to be filled with more and more hope. I recently read some people discussing God's wrath and that perhaps Hurricane Sandy was evidence of that. I know this is no more true than believing that cancer is punishment or accidents are God's will or that God caused Auggie's illness. Believing in the New Testament and believing in Jesus Christ is proof of that. Unfortunately, we live in an imperfect world and terrible things happen. I know that God didn't cause Auggie to be sick, but I do believe He can help him get better. I also believe He is faithful despite the outcome. I know He is faithful regardless of the destruction we are all watching on television. Please keep praying for my sweet boy, Auguste. We have a long way to go! Please pray for all of those effected by the storm last night. Please pray for our President and the decisions ahead of him. Please pray for all of the soldiers, first responders, and other people who are working to help in the aftermath. This is not something that will resolve with the storms passing, and they have a long way to go as well. Well, it seems that Hurricane Sandy is coming to join me in Philadelphia this week and I think she is very likely planning to detain me a while. My doctor called me on her way back from settling her family in NY and let me know she would call me in the morning and see whether or not I should try to come in Monday for an appointment, but it seems the airlines are still going to be closed, so I will not be able to leave before the storm. I have a ticket home on Tuesday, but it is most likely going to be canceled and the airline told me if this happened I would be rescheduled on a later flight automatically. Mickey and I each spent over an hour and a half holding for the airline on separate occasions today, so I am glad that I may not need to worry myself with trying to first come first serve alternate reservations...but I am still in the dark as to when I will get home. Of course, the unknown is disappointing because I would rather NOT be caught in one of the "largest storms of the century" possibly with no power for the rest of the week. I really desired to be home with my family. I miss my kids, and my mom and step dad are coming for Halloween and Grandparents Day this week, and it would be sad to miss their visit. However, I don't really suppose there is much to be done but wait. This morning Mickey was mildly panicking regarding getting me home, but I assured him we would do all we could do to stay safe. He is doing a great job with the kids and has had to do so many extra things this week, such as dress the kids up for a Johnny Appleseed Parade last week and get them in character for "character day" tomorrow. 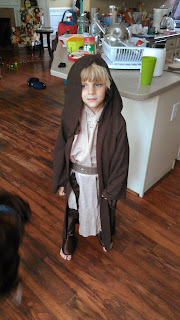 Oliver is taking a Star Wars book and dressing as Obi Wan Kenobi and Eliot is going to be Cinderella and bringing one of her princess stories. Halloween will have even more fun to share, and I hope I can take my own photos and not have to add pictures sent to me, but time and Hurricane Sandy will tell. Anyway, I am from Florida, and I know that you should never underestimate a storm, but they are also very unpredictable, therefore, I will continue to pray for the best, stay safe, and get home as soon as humanly possible. However, the most important thing is that we know that Auguste is still improving, otherwise, he would need a shunt placement and I would be here for at least another week anyway. I truly don't want a shunt if it can be avoided, because not only would that mean my boy was getting worse, but it would also hold with it many risks. Weather reports are still somewhat contradictory, as some say to expect the worst tomorrow morning and to settle a bit by Tuesday evening, and other say to expect the worst by Monday night and through Tuesday, settling by Wednesday. It would be ideal to get into the doctor tomorrow and be on a flight out Wednesday, or to have things all done with tonight and tomorrow and keep my Tuesday appt and Tuesday flight...but I can't really know what the future holds and just hoping to keep enough power to know what is going on and keep my phone charged. Today we went to many stores today stocking up on lights and non perishables, etc...but batteries were no where to be found. We saw people with grocery carts stacked to the brim with bread etc. I am always surprised at how people often will clean out a store stock with more than they need and not leave any for others during times like this. It has never made much sense to me. I believe in being prepared, but I also believe in taking what you need and letting others have what they need as well. The hoarding it all for yourself mentality (just in case you might need it) has never computed much to me. So, tonight I go to bed with the sound of light rain, and I pray for all the people who may or have already been effected by Hurricane Sandy. I pray the damage is minimal and that people remain safe. I pray that Beth and Stefen and Nico (who have so kindly opened their home to me) suffer no damage or injury to themselves or their friends or family,and I pray that my Auggie continues to improve. I am very hopeful for his full recovery, and cautiously optimistic, as the road is still long and just like Hurricane Sandy's unexpected arrival, anything can happen. So please, continue to intercede for my sweet boy. Those are certainly the most important things, but I also pray I will be able to get home really soon, I miss those kiddos very much and cannot believe I have not seen them in person in 10 days. I am happy for skype, but it is certainly not the same as holding them close and breathing them in. Please everyone, stay safe and remember that people are the most important thing. Don't get so caught up in electricity, or batteries, how much bread you have, your opinions, or your fears that you find yourself not putting your family and neighbors first and foremost. I have found a deep sadness of late in the way people treat and accuse each other, smearing the names of good people, seeing Christians being hateful to one another and questioning each others faith and making neighbors defend their faith (and this comes from BOTH sides of the division). I don't think that being so divided and frankly rude to our friends and neighbors is what is seen as favorable in the eyes of God. In reality it is important to remember that nothing is ours and anything we have ever had was only earned due to the gifts we were given. The Lord is in charge of our possessions and our health. And the Lord gives and the Lord can take it away. Perhaps the timing of this storm should show us that. As unfortunate as this storm may be, it should give us each some perspective, and remind us of what really matters in this life. People! I love the way the boy's arms are raised in the air...beautiful imagery. We had a doctors visit this morning and it went really well. I am so pleased because to be honest, even though there are still uncertainties, I truly feel hope after this visit. Auggie's pleural effusions continue to improve and where a few days ago he was mild/moderate, today he has mild mild effusions. His ascites it also continuing to improve. His heart rate is strong (140) and his lungs are large and his heart is midline. All good. Dr. Mark Johnson http://www.chop.edu/doctors/johnson-mark-p.html?view=3 saw us again today. Although there are more than 50 different causes for chylothorax, he said his "gut feeling" was that Auguste had come in contact with a virus. The immune system does not start to develop until week 20-22 and thus his lymphatic system was in charge when this happened, and the bodies response to the infection was with the chylothorax and dumping of lymphocytes, thus causing hydrops. I believe this must have started happening right around the time my Aunt Martha phoned me and said she felt a strong need to pray for me and was anything going on...because only a few weeks after that call was when we discovered hydrops. At the time I could think of nothing, but asked for her continued prayers. This is fortunate because Auguste has been strong and Dr. Johnson thinks he has probably cleared the virus and is now trying to clear the negative response to it. Getting the thoracentesis when we did was great because it was right when his own immune system was developing thus giving his body a head start in clearance. Dr. Johnson once again feels very strongly that Auguste will probably continue to clear this fluid and that it is very likely to resolve completely. He still feels very strongly about watching Auguste extremely closely until 32 weeks, because in his research, he has seen the fluid resolve completely for week upon week, and suddenly develop a huge pleural effusion out of no where, however, we are still very good candidates for shunt placement if that occurs. After 32 weeks, if the fluid is cleared, he feels we would be out of the woods. I am 23 1/2 weeks right now, so a long way to go still. In the absence of mirror syndrome, or increasing effusions or ascites, he feels that early delivery may not be necessary and we could theoretically go to full term and perhaps even avoid NICU, but if any fluid remains on his chest at delivery, chest tube would be necessary. I would really love to avoid premature delivery, as most of you may remember our sweet Bluebird and how difficult is was to see her intubated and struggling to breath, and she was born at 34 weeks when most babies do not have as many problems at that time. Therefore, the thought of having a "wimpy white boy" at 34 weeks, who already has had hydrops, certainly is scary to me. I am delighted that I may be able to carry Auguste to full term. He felt that we were jumping a bit far ahead of ourselves and need to keep ourselves reeled into the present, but that if things stay the way they are or improve by Tuesday, then I can go home and be monitored in Charlotte for a while. Perhaps until he is delivered. We do still have a very long way to go, but nothing about this visit today could be thought of as negative. I am so happy to finally be getting answers and to be given some real hope. Today I truly feel like we are going to make it to delivery, and that I will be able to nurse him and nurture him, AND that Auguste will be in our 2013 Christmas photo. This morning I woke early and prayed. I prayed for guidance and sound information from the doctors, I prayed for peace of mind for Mickey and I, and I prayed for healing for Auguste. Beth and I drove into Philadelphia and she accompanied me to my visit. The sonographer who was with me during the thoracentesis last week was the one scanning me today. I felt a bit discouraged because I could definitely see that there was fluid on the left chest again, and that the fluid on the right was still more. I didn't know if this meant it was coming back or not. The abdomen also continued to have fluid, but seemed about the same. When the sonographer left to get Dr. Johnson (the fourth doctor in the group and the only one I was yet to meet), I began crying. I had hoped not to see any fluid on the left chest. I was concerned due to not knowing Dr. Johnson and not knowing if he was aggressive or if he was reactive, etc, even though we had been assured that he was one of the first members of this group, that he had been up to date on us personally and that the other doctors had talked with him regarding every decision made thus far. Beth could see how upset I was and she commented on how active he was, and she held my hand and she said "so often we talk about things more than we pray about them, so lets pray". And we did. Dr. Johnson entered and we got Mickey on speaker phone so he could be part of the discussion. The doctor looked at the fluid and said that he did not feel that a shunt was warranted at this time. He said he did not feel that the fluid had re accumulated but rather, was redistributing from the right side. He said he would consider the right chest to be "mild to moderate" pleural effusion and the left to be a "mild" effusion. He had no concerns about the abdomen. He said the fluid drawn off the chest last week had 85% lymphocytes, which is consistent with being chylothorax, which can happen for multiple reasons, but explains our problem and gives us better information to move forward as far as interventions. He said he has seen many babies with chylothorax with this "mild" amount of fluid go forward to delivery and do just fine. He said sometimes it resolves after birth but if there is fluid when he delivers, he will need a chest tube for a bit. But he did not worry about lung development as long as the effusions remain mild and that pulmonary hypoplasia was less of a concern if it remains as it is. He said that often times, the fluid will continue to resolve in utero, and sometimes never return, but that you have to watch closely, as it can often return unexpectedly and with a vengeance. He mentioned that there was still a lot of perplexing things about Auguste, since they could not quite understand why he has not yet gotten much worse, but that his presentation today frankly made him feel "warm and fuzzy inside". Yes, warm and fuzzy were his exact words and I can only interpret that as a positive expression!!!! He would like to see me on Thursday morning and again Tuesday morning. The do the shunts on Tuesday and Thursday and he wants to be prepared to do them if they see fluid worsening, but if we go on these days and the fluid is the same or better, that I will be able to go home and get monitored very closely in Charlotte. He said that if at any point the fluid worsens, then "back to Yankee land you go" (his words, never mine). I did forget to ask him several questions, including if we would still plan to do a very early delivery with this new knowledge. I need to write it all down to ask on Thursday morning. It still seems they would want me to deliver with them and see them regularly but it will be nice if I can go home next Tuesday and perhaps be home in time for Halloween. I feel good. I feel that as long as they do not have to invade my uterus and he continues to improve, that is positive and least amount of risk. I feel good that we have an idea of what we are dealing with, even though still unpredictable. I feel good that we are following so closely, that surprises are less likely and we are less likely to be blind sighted by bad news (I think). I have been trying to do my research. It seems the only way chylothorax can be diagnosed is from thoracentesis and thus it surprises me that it is not part of standard of care. I read this article (among others) http://onlinelibrary.wiley.com/doi/10.1002/uog.1883/full which outlines some shunting facts. It touches on stories such as mine where the fluid did not get bad enough to shunt or improved, but since it was a shunt case study, it didn't give me the data or statistics on those cases, however, the reason I am sharing it isdue to the last line. It says that regardless, that anyone diagnosed with hydrops and pleural effusions should be referred to a center that does shunts. As you know from previous threads, these centers are few and far between, and even in our case, we had to do our own research and ask for our referral and call CHOP ourselves. If anyone is reading this who is also experiencing this, please advocate for yourself and your baby, because it seems to improve the chances of at least 50% of the babies diagnosed. I do not know how this new knowledge improves Auggies's chances statistically, but Mickey reminded me that it doesn't matter and that today, everything is good, and improved from last week. I continue to feel the little guy kick (he is currently dancing on my bladder), and that today, we believe we are going to get the miracle we have been seeking. After the visit, Beth and I walked across the street and got huge kielbasas from a street stand. We washed them down with orange sodas and it was an excellent treat. Beth truly felt even more encouraged than I did by the visit, as I think I get distracted by all the things I now need to absorb and learn about chylothorax (because I am obsessive like that). Beth also profoundly touched upon how perplexed the doctor was that Auggie wasn't getting worse and reminded me that we have two things going for us...a great team of doctors, and a Great Physician upstairs, who can perform miracles and do perplexing things! Once again I got to skype with my family...and once again they were just wonderful and I miss them so much. I am happy that I will very likely be able to hug their necks and kiss their cheeks in a week, and that we are doing everything possible to do the same for Auguste very soon as well. Last day before the simultaneously dreaded and anticipated Tuesday...Its a beautiful day full of crisp weather, sunshine and crispy leaves at your feet. Beth and I took Nico to the park and then had grilled cheese, ham and apple sandwiches. Now she is introducing me to the show Sherlock. Tonight after dinner we are going to see Argo. Anything to keep me busy and my mind from all the what ifs. Auguste has been quite tired today, I think, because he hasn't been very active. I listened to his heart tones and they were a strong 145...and of course, he kicked at me then. Its as if he is saying "geez Mom, let me sleep already". 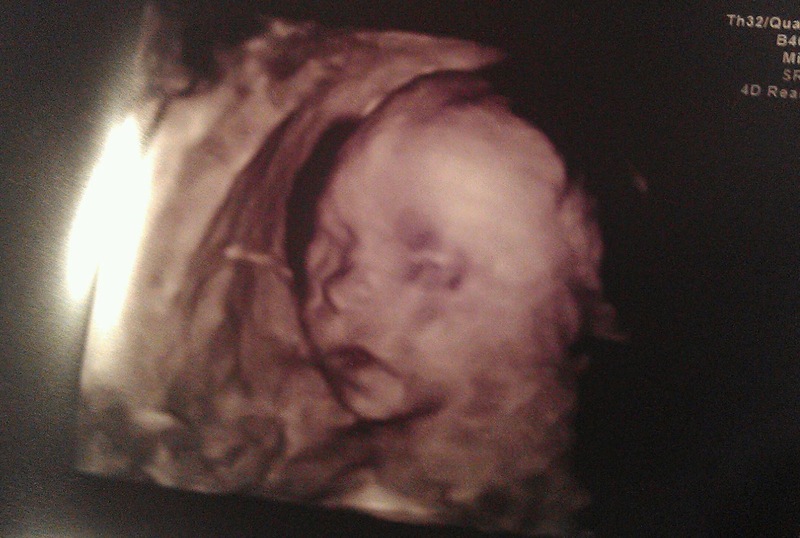 The sonographers always laugh and say "he doesn't like the paparazzi", because he jiggles whichever way they don't want him to move. A funny boy, and I think it is certainly a good sign that he is so responsive. Today I received an email from a girl named Erin. She is pregnant with another hydrops boy, and only a few weeks ahead of me. Her son was diagnosed with more impressive hydrops than Auguste, and at a younger age of 16 weeks and 6 days. Anyway, they have never identified a cause, but at his 19 week scan, his hydrops had resolved and at his 22 weeks scan, there was no evidence of hydrops or any other abnormality. He is due in January and I believe is proof that God is still out there performing miracles everyday. I love these stories and I am still believing all of this is for a reason, and hoping that it includes a miraculous healing for our sweet Auguste as well. But not really on my own because I am in my friend Beth's house with her family...but Mickey and Emily have made it back to SC and they are snug in their beds and I am snug very comfortable but far away bed in PA. I miss them. A lot. Tomorrow morning we have scheduled a skype session. I have never actually skyped on my own before and always depend on Mickey to set it up and just talk...so I have to figure that out tonight. But I look forward to seeing my loves for the first time in 5 days. Emily was really missing Eliot when she was here with us, and kept asking to see photos of her on my phone, so I know she must have been thrilled to be home. I know Eliot was missing me, but it sounds like my Mama's boy, Oliver, has actually done just fine in my absence. Which surprises me a little, but I guess I am grateful. This morning Mickey and Emily dropped me off at Beth's in Ambler, PA...which is actually a short commute to Philly and a very adorable area. If you know me well, you know I have a great appreciation for all things stone and wood and all of the beautiful stone homes and stone work in this area has excited and intrigued me. I also took my first ever trip to IKEA today...which was almost equally amazing to me. I actually bought Auguste his first gift from us...I saw a very soft orange fox, and when I picked it up it has a baby fox attached. The mother/child fox plush could not be resisted. We filled up with meatballs and potatoes and ligon berry sauce (the IKEA special for anyone unfamiliar). It was a fun never ending place where one could get lost and had I not been thinking about luggage and budget, I could have easily filled a cart and bought more than the small mother/baby fox plush. Beth is remodeling, and so we also went to Lowe's and got paint samples and looked at tile....all of which are things right up my alley. We then rested a bit and filled up on a big pot of chili and corn bread and ...wait for it...sweet tea (because yes, my Beth is a true central FL Southern girl). Clearly, my re-connection with Beth after nearly 15 years has gone well. I just hope I don't overstay my welcome, and truly hope my stay in Philly will be brief and only periodically. I am actually quite nervous about what Tuesday holds, and I am just trying to not think too much about it. The last procedure was extremely painful, and the thought of doing that again without Mickey is scary to me. He will say he didn't do much...but his presence in those situations calms me a bit and eases my spirit. I am also nervous about a shunt. I suppose i am nervous about anything that will possibly irritate my uterus into early labor. I know I will do and endure whatever needs to occur, but it is all scary. My thoughts are that they will possibly decide another thoracentesis, but I am not sure how they will drain the right side since it seems with that procedure they just take fluid from whichever side he presents them with, and therefore have less control of it. This does seem less invasive though. If they do that, I would imagine they would want to see me again before the weekend, and possibly, if the fluid is still gone, allow me to go home. If they decide to do a shunt procedure, it is more surgical, but same day type surgery. They do dope me up and bit and use local anesthetic, so it would certainly be more tolerable and I am sure that Beth would have fun stories to tell afterward, as did my best bud Jenny when driving me home after my wisdom teeth were removed. I tend to tell people silly things when under "the influence", apparently. I still need t discuss with them options for delivery and make some plans regarding this. I know this is preemptive planning...but I am feeling confident today that Auggie will make it to delivery. I am feeling like we should possibly plan a delivery in Philly since the doctors here are already invested in him and I know their NICU is one of the best in the country. I think that sounds great if his NICU visit was brief but certainly an extended stay would make that much harder. However, either way, a planned delivery will unfortunately not be very close to home, due to Greenville not having ECMO. We need to be prepared for anything, but who knows...maybe he will come out and be just fine. I have read a few stories similar to that. I know I am jumping too far ahead, so I will reel myself back and focus on today and only think briefly about Tuesday. Because all of this is theoretical, and are only my best guesses to many of the questions people have been asking. I am thinking that I will possibly ride the train home from Philly as I have heard the train ride through Virginia is quite nice. I am probably going to recruit Jenny to ride with me...(she is just reading this now and probably thinking..."huh?"). It seems like a potentially fun adventure and since I don't have a car and don't want Mickey driving another 24 hours with all 3 kids, it makes sense. Emotionally, I feel good. I sometimes feel the dark thoughts creeping up, and I try very hard to block them from my mind and it seems to me that it is not long after that I feel sweet kicking from the inside, just in time for me to feel reassurance that at least for today, my sweet Auguste is with me. Looking at baby stuff at IKEA today was almost bittersweet, and then I decided, well, maybe I won't buy these nifty sippy cups, but I can buy him a softy to cuddle...and I can plan a little...because I am going to keep my focus on the 10%. AND hope that in the next few days, that 10% may actually turn into the 65% as the fluid continues to improve. Fortunately, lately on the hydrops page, there have been other stories similar to mine, other people getting shunts and getting more hope, and I truly believe that could be a sign of better things to come for these sweet babies and parents who are fighting along side of us. Maybe they will change the face of this prognosis from grave to hopeful as research continues to be done. Keep up the faith and keep hoping and praying with us. For me...who Beth is pushing lots of water and making sure I am eating and staying calm, because I certainly don't want to do anything which may raise my blood pressure right now...For my family at home, who are having to make adjustments and definitely have their life altered in a home where Mommy was always present and is now missing, but mostly, please remember our sweet beautiful boy, Auguste. He is so precious and active and I want him to be able to experience life on this beautiful earth where he can fill his pockets with rocks, and pick dandelions, and swing high, and run fast,and feel the hugs of his siblings, and to sleep on Daddy's chest and to curl up next to me. There are so many things I want for him, so many hopes I have for him. Those are only a few of the images that calm me during this storm. But they do feel very real and I know they are very possible. I know we serve a God of miracles and that He has placed me in this position for a reason, although it doesn't make sense to me today. Today was a take it easy day us and Mickey's last day with me for a while. We slept in (a bit because we are usually up at 6 and today was more like 730). Then we went to the Rodin Museum, which was pretty amazing. Downtown Philly is truly beautiful and you just sometimes forget how much history took place here. We drove over to see the Liberty Bell. The line was reaaaaallllly long so we just looked through the window and walked around a bit on the old colonial stone streets. I started feeling spent and we went and met my friend Jean and her fiance Paul at The White Dog Cafe. Now, Jean lives in Charlotte, so don't ask me why we meet up in Philly for lunch but hardly ever in the Carolinas. The Cafe was quite ritzy, but quaint and the butternut squash soup I had was pretty fantastic. Paul currently lives in Mississippi where he is finishing his residency. He is from Sacramento, CA but he is engaged to Jean, who lives in Charlotte, but who I know from Tampa, but whom I actually met in Equador. We decided to meet up for lunch in Philadelphia. Paul realized Mickey was from Oregon and proceeded to tell us that his parents live in.....Klamath Falls, Oregon....the exact place Mickey was raised and where his mother also still lives. I am not sure we have ever met anyone who had been to or even heard of Klamath Falls, and yet, here at this little brownstone cafe in Philly, we meet Paul. A very small world indeed. After lunch, we went back to the hotel and pretty much stayed in the rest of the day due to rain and just being tired. Emily has been off on her naps and sleep schedule, and just thinks she is supposed to be staying up with mom and dad partying all the time...which is exhausting, but kind of fun. She is enjoying having us all to herself...but has made it very clear she misses Oliver and Eliot and is constantly bringing me my phone to see pictures of them and saying "Eliot again". Cute girl. She will see them tomorrow...until then, I am going to keep her close to me. I can't wait to frame in in Auguste's room. Countless others are offering prayers and support to us in so many ways and I am not sure I will ever be able to truly let them know how much it means to us. Yesterday we made the long drive to Philadelphia again. The drive was once again beautiful. This time was a bit different because we brought sweet Buttercup with us. Pa Ken came to SC to watch the older two and keep them in school, but we decided to bring Em with us. She was quite the trooper. She was sweet as pie the entire 12 hour drive! We made it to Cherry Hill, NJ around 10 pm and were sacked and asleep pretty quickly. We are fortunate because the hotel we have been staying in is in Cherry Hill, NJ, but only a half hour commute to the hospital. They give us a special rate of $55 a night since we are here for the hospital. I actually plan to be here for a little while, but Mickey and Em are going to head back to SC on Saturday so that the daily SC life can keep on going. After he leaves I will be staying with a college friend, Beth Johnson DeWet. We actually roomed together for several weeks in a little town in Nicaragua, so I think she knows that she doesn't need to go out of her way to entertain me. I am pretty easy going. I told her that since I had seen her kill a roach with her palm in a sleeping bag with no air conditioning and a mosquito net, that there was little she needed to do to be a better condition than our past shared space. I am so grateful she is letting me stay with her and her family, as this will make a huge difference financially as well as emotionally. I will miss my family so much, and I hope it is only a few days, but could be a bit longer. I just really hope to be home by Halloween. Today we went to the hospital, SDU (Special Delivery Unit) where they know us by name. Once again we really could not imagine getting better care and bedside manner from everyone starting at the front desk to the doctors. Everyone is so gentle, kind and personable. After our Ultrasound we met with a doctor named Dr. Julie Moldenhauer. She was very nice. She said that once again, she only felt that the fluid on his chest was "moderate". She said his heart was still in the correct position and that his lungs were not at all flattened by the fluid. She said she certainly had seen much worse in terms of hydrops and that she would not put us in the "dismal" category, but that unfortunately, hydrops is never good. She did feel that it appeared the ascites (fluid on abdomen) may be a little worse, and that overall, she felt that drawing fluid off his chest may improve the abdomen. She said we did not need to do it today, but would need to do it in the future. We talked about lung development and risk and benefit. She felt that she could do the thoracentesis safely and we decided that we would proceed. She got everything set up and even brought crackers, milk, and markers to Emily so she would be entertained and Mickey could stay in the room with us. The sonographer started checking Auggie's position and that little booger had balled himself in the very corner of my uterus and they had to let me take a walk around the unit and dance around a little to get him in a better position. At this point, Dr. Moldenhauer was called to the OR, so Dr. Martinez-Poyer came in to do the procedure. Initially, Auggie was in a perfect position and we got started. The procedure is very similar to an amniocentesis and they make one swift pass through my abdomen, and then my uterus, and into the baby to draw off fluid. The amniocentesis I got was definitely uncomfortable, but do-able. When Dr. Martinez-Poyer started the thoracentesis, I was surprised that other than some slight cramping, it wasn't so bad at all. However, Auguste immediately shifted making it difficult to get in his chest without going through the placenta. He tried to shift position and this certainly had my nerves shot and I was sweating up a storm, but it really wasn't too painful. The doctor said that it wasn't working and they would need to put another needle in. This time, he had to insert the needle laterally, and I must say that I felt the pain was pretty excruciating. Mickey said I cried (I didn't), but I did cry out and apparently at some point said I wasn't sure I could take anymore. The doctor explained that when the insert laterally they hit a lot more tissue, etc. Fortunately, Dr. Martinez-Poyer was unfazed by my pain and got the job done. They were able to pull some clear fluid off of Auggie's chest. I do not know if this is good or bad but he did mention that a baby they did yesterday had bloody drainage. Because of the pain, I was unable to watch the procedure on the screen, but Mickey said it went smooth and you could see them empty the entire left chest. Afterward, as we were checking his heart rate (which didn't raise a bit and stayed a steady 149)we could see that the left chest looked just as it should with no fluid. There was still a good bit on the right, but we had decided that for today, we would only draw from one side. The plan is to return Tuesday for another ultrasound. At that point we can see if the fluid is better and perhaps evened out from the right side, if it is still clear on left and still on right, or returned. At that point we can decide whether to do another thoracentesis, or to place a shunt to have continuous drainage. Each time we do this, there is a 1-3% chance of putting me into early labor, so that makes me a little nervous. However, so far so good. I am still in a little pain, but I don't really like taking even Tylenol unless absolutely necessary. I have been trying to just take it easy. They said they should know if it is chylothorax fluid by today or tomorrow and that they would call us if positive. I am not sure if that would be good or not, but, so far we have not heard from them. Overall, I am encouraged. I just feel like we did the right thing. I truly am impressed by this team of doctors and CHOP as a whole, and feel that if anyone if going to change the "standard of care" for all of these poor babies, it will be them. We did go to downtown Philadelphia and checked out the Museum of Art. It is truly a beautiful city. We ate tortellini in the museum cafeteria and then looked at some pretty amazing art including from Auggie's namesakes, Auguste Rodin and Pierre-Auguste Renoir, as well as Monet and Picasso, etc. I really loved the shaker furniture, etc. We didn't stay long because I was feeling sore and Emily was getting a bit roudy, but our tickets were good for two days and also include the Rodin museum, so we will probably go back tomorrow. My friend Jean is in town for a conference and we are going to try to see her and finally meet her fiance Paul. Mickey and Emily also got to run the famous "Rocky stairs", Mickey believes this is a true piece of Americana, so it had to be done. Sillies! I have added some photos of some of those fun things. I have been trying to trust God even in the little moments, and to stop having so much anxiety about what tomorrow may hold, and instead take all this one moment at a time. Breathing in and out and focusing on the present. Now I lay here and even though a little sore, I am grateful to feel the pain and also for being able to feel Auguste kicking around inside me. Even though his little active restlessness make procedures more difficult, I know that his activity is a positive sign for him and I am grateful for it. I listen to Emily in the other bed, singing Twinkle Twinkle and doing anything to keep from falling asleep, I think of my sweet babies who are snug in their beds in SC, and I am so grateful for all that has been given to me in this life. Tomorrow is my last day at work for a little while. This was a hard decision, but felt like the right one considering we have not known what we are doing from day to day for the past 3 weeks. I am very close to many of my patients and it was all so sudden, I know its the right thing right now, but have a hard time thinking of not having a chance to explain to my sweet patients, my friends, why I am not there and for a few, why I didn't get a chance to say goodbye. We are going back to Philadelphia tomorrow night. My step-Dad is coming in to watch the kids, and then next week he will take them back to Florida for a short vacation until we can return. This is stressful because we could potentially be away from them for nearly 2 weeks, and we have never been apart for that long. I feel so sad, because I will miss them so much. We are taking Emily with us, because she is too young to understand, but we are trying to keep the older kids life as normal as possible, under the circumstances. I cry a lot and the kids sometimes see me. Yesterday Eliot actually started crying with me, which was heartbreaking. Then later that day she saw me crying again and told Oliver "Mommy is crying, again"...Oliver said "Mommy, you are crying a second time". I try to explain that I am Ok, and that sometimes Mommy's cry when they are worried". I keep getting messages and it seems the one constant thing people comment on is my faith. Apparently it is inspiring. I am glad for this, but it feels like a big facade. I don't feel faithful. I don't feel positive. I don't feel hopeful. I just feel this big empty sadness inside. Yesterday and today I took the kids on a walk, and we picked flowers and I was in awe by their beauty. I put the flowers they gave me in my hair, and I received their big hugs and kisses. It was perfect and yet, through it all, I still felt so sad. I haven't even lost Auguste and I feel this sadness. I imagine it will recover when he recovers, but if by chance he doesn't recover, I know this sadness will remain, forever, I guess. I think I really and truly feel he will be one of the survivors and that everything will be ok...but then I read the very large number of things from mourning parents, and I realize that no matter how hard I try, I cannot ever truly prepare myself for the possibility of losing him. Not now, not later. Today they were finding heart tones, and it took her a second. His heart rate is perfect, but that brief moment had tears spilling down my cheeks. I can't stand the thought of it. I can't bear it. I keep telling myself that I need to focus on the next 10 weeks, and then we will be coming on delivery and a new set of challenges...but that when Auguste is celebrating his 4th birthday, that this 10 weeks will seem but a blip in the grand scheme of life. We can only do things one day at a time, and although every day may feel heavy and tired, I need to hold out hope that the days will keep coming and the weeks will keep passing. I truly do believe these verses. I truly do believe the word of God. I believe He can do these things! On other notes: we found out today that Greenville does not have ECMO (refer to previous thread) but this means the NICU here will probably not have the right capabilities for Auguste after he is born, and therefore, we will need to plan something elsewhere, which will present a whole new set of problems and hurts me to think about being away from some of my kids in order to be with another....and I know we will cross those bridges when they arise, but we definitely have a lot of balls in the air, both financial, physical, and emotional, and we just need prayer that we can keep them all from crashing down on us. This week has been a whirlwind....literally...we have been running. Yesterday we went to Charlotte and met with Dr. Courtney Stephensen with maternal-fetal care specialists and Levine hospital. We really loved her. She felt that all the appropriate tests had been run thus far, and agreed with the fact that we do not yet have a cause. She let us know that she would spare us the "gloom and doom" speech because it was clear we had already heard it, and that we seemed to be pretty knowledgeable about the statistics and diagnosis. What she was able to do, which is what we appreciated so much, was to discuss the if this then that scenarios. We talked about what happens if we make it to delivery. She actually disagreed with Csectioning being the best option as a vaginal delivery can often expel fluid, and is safest if possible. She said she would recommend measuring his abdomen and if it is larger than his head at time of delivery, she could draw some fluid off of his belly right before we induce labor. She felt that our tertiary care center in Greenville is as good as the one in Charlotte, but did recommend us meeting with a neonatologist as soon as possible to get established in the event we spend time in NICU. She also felt that the later he is born the better, and felt that we should not try to induce unless me or the baby shows clear distress. The best information she was able to give us was about the hydrops itself. We have not had a good understanding on what about the hydrops was actually deadly. I felt that if the fluid started getting worse and compressed his heart, that is when he would die in utero, vs the fluid staying the same and his lungs being undeveloped, thus having his die shortly after birth. She did not seem to feel that the fluid itself, as it stands, would kill him, unless it does indeed worsen. She said that even after birth, lungs can be quite flexible and that you do not need full capacity for survival, thus feeling that even not fully developed at birth could likely be reversed. Her concerns were primarily the underlying cause for the fluid. The fact that it is unidentified and effecting both lungs and abdomen, could indicate a significant unidentified cause, such as something metabolic, etc. Unfortunately, I had already discussed metabolic testing with our genetic counselor, and she told me that due to the lack of clear fetal values, they had stopped running them at the genetic centers. Dr. Stephensen said that this underlying cause is what could kill the baby at any time. It may, it may not, but no one knows because we don't know what it is. It could be metabolic, it could be a type of infection they don't know to identify, etc. She spoke highly of Children's Hospital of Philadelphia (CHOP) and felt that they have great scientitists and doctors and have some cutting edge techniques. She did not feel that she could give a rational reason to draw fluid of chest due to the fact it is also in abdomen, but did state that if CHOP advised it, she could certainly proceed and help us under their protocols. She apparently has a lot of experience with these procedures, and was also able to explain how they work and ease our mind a little on what could be involved. She also let us know that she would like to keep following the baby and that since she would be the consistent person doing and looking at our scans, that she would be able to gauge if the fluid were worsening, improving or staying stable. I think this has been difficult in the past because we have not seen the same maternal fetal doctor in Greenville at any of our visits. I believe we will be seeing her in Charlotte approximately every two weeks for monitoring and then of course, whenever needed based on CHOPs recommendations. Mickey and I both felt at ease with her and felt that she understood where we were coming from and would work with us so that we would either have baby Auguste as healthy as possible, or have peace of mind with the outcome. My mother drove in from FL yesterday and therefore last night we had a busy night. The kids are so excited she is here, they actually want us to be gone til Sunday vs Saturday for an extra day with her. even Emily followed suit and just trusted her immediately. I feel at peace knowing she is with the kids because I trust her and so do they. This morning she drove the kids to school, with me, so we could show her where their classrooms were etc. She just loves the kids school (as do we), because everyone is so friendly and involved, from parents to teachers. We drove up today and it was such a lovely drive. The entire trip through NC, to VA, and through Maryland was just beautiful. The leaves were changing and the farms smelled of fresh baled hay. We kept the sunroof open and played the Sirius radio, and we really enjoyed ourselves. We are settled into our hotel now. It is actually across the line from Philly, and they gave us an excellent rate due to being here to go to CHOP (yes, the people at CHOP are very accommodating which has made this a very easy trip). The hotel is nice and has free parking and free WI-FI, which if you know me well, you know that not having these two things in a hotel accommodation are maddening to me. Mickey is already snoring. I should be getting that way as tomorrow is slam packed with stuff going on at CHOP. We have to be there by 7am, and they said to expect a 30 minute drive for traffic. Everything will take place in the SDU (Special Delivery Unit), and they said they would have some muffins and fruit. We have another ultrasound at 0730, we have an MRI at 1030 (this is one of the offerings none of the other facilities could offer and will possibly give us some better views), we have another ECHO @1330, and we meet with the doctor at 1500 (excuse military time but I am a nurse, ha). They said we won't be leaving til after 1600 (4pm). We chose to drive because it is possible they will be done with us then, or they could quite possibly want to schedule a procedure or something over the weekend. The one thing we will know after leaving here is that we have talked to the leading specialists regarding this condition. They have published and done research on it and they have successfully done interventions which seem to have increased the odds of survival significantly. This is why we are here and what we want to explore with them, even though we understand that it is possible, our Auguste will not be a candidate for any of this. But without coming here and bringing him here, we would never know. I feel blessed to have this opportunity. We are still hopeful and we remain faithful. About a week ago a lady posted on the fetal hydrops support page on facebook that her daughter was diagnosed with hydrops at 14 weeks, she was now 18 weeks, and that her doctors were urging her to terminate due to the risk of mirror syndrome (which is a condition that can sometimes cause the mother similar symptoms to the baby). I didn't respond to her post at that time because this is a personal decision and I didn't feel my two cents were needed which she was already facing such a difficult decision. She posted last night that she decided to follow doctors orders and was in the exam room waiting for the doctor and looking at the tools he had on the table, and she just decided she could not do it. The doctor didn't understand and she told him it felt too much like an abortion and she just would not have closure. He told her it was not an abortion if the baby was already dead, and put a doppler to her, at which point her baby girl had a nice loud heartbeat. She is not unrealistic, she said she really didn't know how long the baby would hold out and understood that there may come a time where even her own life is put at risk, but that she wanted to let nature and God have a part in the plan. I was so happy by this. Because the truth is...this is how Mickey and I feel. We don't know how it will all turn out, but we are trying to enjoy every bit of being Auguste's parents. Every reassuring kick, every time we hear his heart beat or see his beautiful face on ultrasound....they are moments we have with him. I am not going to say it won't be dreadful to lose him, but I am learning to be thankful for each day. I hope to have years and years to come, but I am thankful for each day. I am thankful for each moment that I get to experience being his mother. Each tear we shed, each moment we share, they are out of a deep and unfaltering love that we have for our child. Our son, Auguste. This has even brought us closer as a couple and family. We are so committed to each other and making these decisions together, and I know that at least I have developed an even deeper admiration for the character of my husband. His willingness to stay right by my side and take equal partnership in decisions we make for Auguste. Because he loves him, just as I do. He is such an admirable father and puts them all first, all the time. I feel that Mickey and I have been challenged by not just using words to say what we believe, but actually having to take action. It is so easy to think you know right where you stand on things, and then having to actually be tested by being in a situation. I have felt affirmed that we stand together on these issues and that affirmation, although putting us in a potentially painful situation, and certainly a challenging one, both emotionally and financially, has been reassuring and I believe has made us stronger as a couple. We respect each other and we respect family, we respect life and we even respect death as an extension of life. We respect it as a beautiful part of the human condition. We also respect the bigger part that we don't understand, and through all of this, I think have started to deal on a very personal level the fact that we can't control everything, and that things may not turn out how we desire or pray that they will, BUT that things can make sense even when we don't fully understand them. That is faith! That is hope! I don't know how I will feel tomorrow, but the past few days I have shed less tears and I truly believe it is because I have found a sense of peace. "it is well, with my soul". I don't know how it will turn out but I am finding that no matter how it turns out, it will change me only in that it makes me stronger and more faithful in the great mystery that is God. Please pray for our guidance and the wisdom of the doctors to help us make sound decisions that will be the best possible thing for Auguste. Today was a long day full of many emotions...but I am proud to say I think I only actually cried once. I think that may have been because we were just too busy to do much crying. We had our ECHO this morning with a doctor named Austin Raunicker. We loved him, by the way. Not only does he do missions in Viet Nam, but he seemed to totally support our decisions to exhaust all resources to save Auguste. He studied the heart for a very long time and could not find any abnormality. In fact, both he and the fetal maternal doctor said "beautiful actually" when it came to describing the way it was working. He told us that there was an "impressive mount of fluid compressing the lungs, but it was not compressing the heart at this point, but that the one positive thing he could say was that this was a "very vigorous baby boy" and that was "uncharacteristic for a hydrops baby", as usually they show little or no movement. We told him that we wanted to do all we could for this child and that he was wanted and that we wanted to be aggressive. He sat down with us and said that he and his wife would be doing the exact same thing and do everything that they could to save their child's life. He told us that there were many children alive today because their parent's were willing to do anything, even innovative techniques in order to save them, and that Auguste was lucky to have us as his parents. He said it was always better to go down like a lion that passively like a lamb. He gave us his phone number and cell number and told us that more minds were better than one, and that although he could find no abnormalities, he was not offended by having the other experts double check him and even wanted us to do another ECHO with his partner next week. We really liked him because he seemed to understand us from the heart of a parent. I said Yes, and Mickey said we should have reminded him that so could he! Basically, that was a day of mixed emotions and unfortunately, we either meet with doctors who support our advocacy, or ones who think we should have just terminated the pregnancy and don't expect much to result from it. He immediately called CHOP and they asked us to fax our information directly over, and even called us this evening to discuss their thoughts. We also called San Francisco and they want our information faxed tomorrow as well. She was very nice and actually said that they would look it over. She did give the disclaimer that often times they do not shunt or do thoracentesis unless they feel the lungs are the source, which is sometimes apparent from one side of the chest filling up before the other side. This discouraged me because I don't think this is our case, but we will fax the info and see. However, CHOP called us tonight and went over all the details and we told her our thoughts and the discussions we want to have. She said they actually have co-managed cases with Levine (the center we are going to on Wednesday in Charlotte). However, she stated time was of essence and they wanted to see us Friday. FRIDAY!!! Wow. So, this is obviously difficult for everyone but I am fortunate to have a mother who is coming up to watch the kids and make sure they stay in school, etc. I will need to make sure I get her on the school list because I don't think she is an approved guardian since she doesn't even live in the state. She is talking to my step dad and making a plan to get here. I texted my manager, who will of course work things out, even though I know it will not be easy on her. I am fortunate to have an understanding team of practitioners and am reminded once again why I chose to move to Greenville to work for the cancer centers. Mickey is looking for plane tickets and hotels and we really have no idea what happens next. At the very least, they say there is nothing to do but wait, and we know we have spoken and been evaluated by the leading people regarding this. It is stressful as it seems that there are so many causes to hydrops, and so many cases that go unsolved, and so many deaths, that there are still very few answers and only a few techniques thought to be useful. Therefore, we are still awaiting a miracle. We are still holding out high hopes that our "vigorous boy" will fight through this and having faith that he will survive this. I look at his sweet face above, his pointy chin, and the way he looks like Oliver, the way he looks like me. Please continue to keep Auguste in your prayers. So much of this weekend has involved just going through the motions. Mickey and I went on a date, and we tried to talk about anything except what we could not get off our minds. We took the kids to the movies this afternoon, and tried to focus on the movie, and laughed appropriately, but wondered if it was possible to actually forget for a moment...because all I can really think of is the dread and fear inside me. The kids do adorable things and I smile at Mickey and my mind starts thinking of the laugh I might not hear. I think this is depression. I know I need to pull myself out of it. All day long I have been blessed my the sweet little kicks and movements of our sweet Auguste and I know I need to be confident in my prayers and confident in my faith. But sometimes it is easier to say this and even think this, but harder to truly feel it. This evening I learned that a high school friend, a lively, fun person who brought joy to everyone she met, I learned that she lost hope and is no longer with us. I know how many people loved her and that she hid her pain from all of those people, and when she needed them most, she didn't reach to them. Mickey and I have been effected by this more times than anyone should, and it is awful because you wonder why they didn't trust you. If this or if that, so many what ifs and whys. So many questions. I feel so blessed that I haven't hidden my pains, and have been surprised by the outpouring of love, even friends from 20 years ago, that have let me know that they are holding me up even when I feel like I barely capable of crawling. I am amazed daily by the way God communicates to us through relationships. Through love. It sometimes feels as if it lets us down, and humanity is deeply flawed, but if you take a moment to truly open your eyes and look around, you will see so much beauty, and so many revelations of God. The simple ones that cannot be denied. Blue skies, Mountains, Falling golden leaves and rebirth of green each year...and the more complicated beauty, the forgiveness of a friend, the embrace of someone you have missed, the unexpected email or card in the mail or text or voicemail. If you feel lost, if you feel alone...reach out to these things...embrace them and know that no matter how dark it seems, there is light waiting for you. Yesterday when I was driving to work I was praying and I just felt so small. God is so so great and vast and all the traffic around me was full of others praying for miracles...I read my devotion and it actually addressed just that. It said that although He is unimaginably vast, He chooses to dwell within us, permeating us with His presence. We should be awed by the power and glory of His spirit within us. Today I feel weary. It really started yesterday afternoon when I was driving home from work and I felt completely exhausted as if I could close my eyes and fall asleep. Mickey thinks I am depressed and he may very well be right. I felt lots of movement yesterday and have even felt movement today. I think maybe my weariness is due to the fact that I am beginning to feel so pregnant. I am small and therefore it is the time where I start limping due to the extra pressure in my hips, and my pants no longer fit. I need to go get maternity clothing. I actually gave all of my maternity clothing away two years ago after Emily. At the time we expected to wait three years or more before discussing another child. However, due to some circumstances with our work and our ages, last Valentine's Day I received a message from Mickey telling me that he was ready for our fourth child. How appropriate that Auguste was conceived and few months later and his due date is actually February 14!!! But, back to maternity clothing, I need some. I need to buy new clothing and it terrifies me! I usually would be so excited to find a reason to go shopping, but my heart isn't in it. I think this scares me because I wonder if my hesitation means my faith is not strong enough. Those dark places sneak up on me and I feel that maybe God will not grant me this miracle because He doesn't think I have enough faith. Maybe if I could pray more or get more people praying or find more time to weep on my knees, maybe then things will turn out better. The worries of two weeks ago seem so insignificant. Politics. Bills. Student loans. Houses. Where we will live. I think I just realized that so many things that mattered then are so ridiculous. That it really doesn't matter who gets voted in because the truth is, I can't imagine the world changing dramatically in 4 years and all I want to do is be planning Auguste's 4th birthday party. I don't care if we don't have the perfect house in the perfect location, I just want my four healthy children. My sweet sister told me that she told God to scrap all she was praying for a few weeks ago, and just give her the opportunity to run her fingers through Auguste's hair and hear him laughing with all of his cousins. Basically today I was just full of feelings of being small and helpless. I would go to the bathroom and sob for a bit, pull it together, see a few patients, and so forth. I cried the whole way home. I saw a post on a hydrops group from facebook. It was a father who was wondering about the shunts, as his daughter was just diagnosed with hydrops at 18 weeks. He clearly had seen the survivors that had shunts, and had been researching just as we have been doing and he sounded as desperate as I feel. I responded with what we have done and hope to hear from him if he learns something I don't know, and I pray his baby AND my baby will survive. But it left me feeling insignificant. I realized that heaven is flooded with desperate pleas right now. And that the more children diagnosed, the odds of us being in the 10% go down...maybe. I don't know. Its all ridiculous and I just feel utterly helpless. I feel like there is nothing I can really do to change the outcome. It has been a down day, but I feel so blessed that we have such a wonderful network of people who love us! I know that so many people are praying and believing with us for his miracle. Today I had two friends, Jenny and Jean send me messages about breathing and being present in this moment and to look around and see all the good and be at peace. One of our doctors, Dr. Kathy Christman, who is perhaps the most sincere person on the planet, gave me a book called Guerrillas of Grace, Prayers for the Battle, by Ted Loder. It's a beautiful book of poetic prayers. I also came home to a sweet package from a friend, Laci, with lots of feel good things like a journal and bath salts and chocolate.The journal says on the cover "She woke up and realized she had forgotten the definition of the word 'impossible'. She decided it must not have been important". There was also a sweet soft, blue bunny for Auguste. His first gift. Thank you Laci. 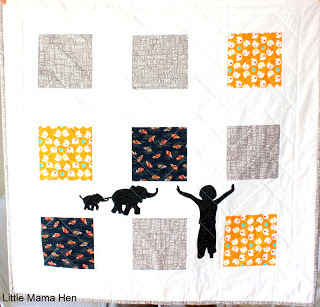 My dear friend April sent me photos of the fabric she started piecing together for his quilt. It was everything we talked about a few weeks ago before all this started. I can't tell you how much it means to me that she has enough faith to start making the quilt despite what we have learned. She says she has no worries and she can't wait to meet him because she loves him already. So, on the way home, I listened to a beautiful song "On My Knees" by Jaci Velasquez and I cried and cried and cried. I cried because I am small and helpless. I cried because I love Auguste so much. I cried because I am ashamed of the many times I forgot what is truly important. I cried because I know God is with me. Then I dried my tears, and I went to the store and bought a funny birthday card for my best friend, and I bought a fistful of rainbow colored nail polish. After my visit to the store, I came home and did pedicures for me and my sweet Eliot and Emily with lots of colors of red and purple and blue and yellow and green and orange. We did it to honor sweet Makiah. We did it do feel good together. And right now I do feel a bit better. And I truly think God is bigger than all of these worries. He knows my heart. He knows I want Auguste alive and healthy. He knows the outcome and how my prayers will be answered. And He is not unlimited in His miracles, and He can save these babies. My Auguste and the other babies too. I truthfully don't know if He will and I don't understand why. Because there is this big tapestry of life and God sees the beauty of it and I can only see bits and pieces and the knots and twists. It reminds me of when I was living in Brussels. 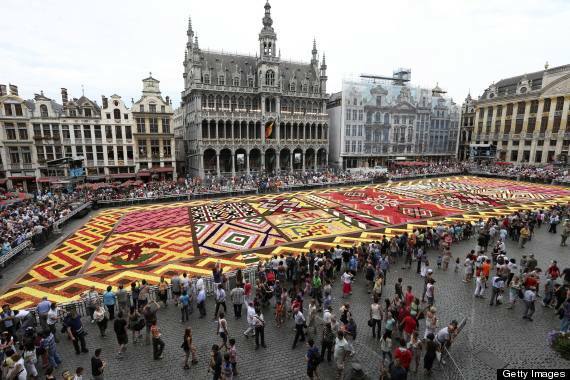 Every few years in the Grand Place they do a beautiful floral carpet. It is all flowers and up close it is amazing and you see lots of flowers, but you really have to get up very high to see the entire picture. I think that is a lot like life, right? We just are too close to see the big picture. I hope the big picture includes us planning birthday parties and soccer games and play dates with Auguste. I have faith it will...as I still feel his sweet kicks. Please don't forget to pray with us tonight. This morning we got to see sweet Auguste. He was sitting breech with his face nuzzles against me, hands by his face, heart beating with a perfect heart rate of 146. He is still growing and developing on schedule. Yes, there is still fluid on his chest and abdomen. It was really hard to tell if it was more or less, and we did not have the high risk doctor to tell us, but we have learned that it not quantitative, and it is really the presence that is troubling. We were able to meet with one of my favorite doctors who is good at being positive with us and were able to have a lot of questions answered. So far all of the testing has come back normal. There are still some rare things pending, but the TORCH (Toxoplasmosis, Other viruses, Rubella, CMV, Herpes) have come back negative as well as most chromosomal disorders, and cystic fibrosis. We have our cardiology ultrasound on Monday and on Wednesday we are going to the Levine Children's Hospital in Charlotte to be re-evaluated and try to get some further answers regarding lung development and possible interventions. http://www.levinechildrenshospital.org/body.cfm?id=866 We are excited about that as it is only a 2 hour drive and we can go while kids are in school. However, we are already looking at Children's Hospital of Philadelphia as they are supposedly very cutting edge regarding hydrops. We are interested in the thoracic shunting in utero, and are unclear as to risks and benefits. It is certainly not standard of care but we want to at least be able to have an open discussion about it since we have seen some success stories with this intervention. Of course, the ECHO on Monday will determine if we need to go this route, as there still could be something we have yet to see going wrong with his heart, and if that is the case we will need to move a different direction. I have learned so much in the last week, and I am still learning a lot. I have found a lot of support. http://carlihope.blogspot.com/p/hydrops-information.html has been a very useful blog, and the owner of the blog has been very supportive and given me lots of direction. Thanks Katie! She also directed me to www.tinyheartbeats.org, which will be sending me a fetal heart doppler, hopefully next week. Until then, one of my fellow nurse practitioners is going to try to dig out an old doppler she used in the past for other purposes, and if it still works, I can maybe be able to have the peace of mind I need without leaving work. The past few days I have felt very hopeful and confident. I am not sure if perhaps this has all just made my faith stronger, but certainly I feel more of a peace. The kids like to talk to Auguste and even Emily kisses my belly and says "Luf You Auggie". I know he hears us and I want to will him to stay strong and come join us soon. I have had so much prayer and support. Today I received a random email from a grandmother who had a granddaughter who survived hydrops 4 years ago and is healthy today. I am not sure if she received my email address perhaps from a forum where I may have asked a question, but hearing from her was comforting. Unfortunately, internet searches offer many more horror stories than survival ones. I hope that when all of this is passed, I will be able to use these blog posts to offer comfort and reassurance to some other mother who is awake all night searching for hope. I was reading my Bible the other night and a small card fell out of it. It was about the size of a business card, and had a precious moments photo on it, on the back it said "Let's conquer the impossible together". It was from my best friend, probably Given to me in college for some purpose. Who would have known 15 years later it would be so relevant. Tonight I found an old charm I used to wear often, but had long since lost (I have a little girl who likes to borrow my 'fings'). Anyway, I found it tonight in the bathroom, but it looks like it has been on a journey through the sandbox and is no longer wearable. But, it is a small mustard seed, with the verse on the back that says "If ye have faith as a grain of mustard seed, nothing shall be impossible unto you" Matthew 17:20. So I lay in the bathtub tonight and admired my beautiful swollen belly, and I rubbed my charm and stared at that small mustard seed. I believe. I have much more faith than that mustard seed. I have found myself staring at newborns with more awe than usual (because lets face it, I have always loved children), but I was specifically taken back by a photo of a baby nursing yesterday. I haven't stopped thinking of it, and thinking of all of our sweet images of Auguste with him nuzzled to me in the exact same way. I believe! I am holding out all hopes that my Auguste will be nursing healthily in a few short months.